We were asked on the telephone recently “Why should I train with you?” We had never been asked this question before so we told the caller the benefits of our cosmetic courses and what makes us different. Cosmetica staff had previously avoided comparing our courses to the Botox training sessions provided by other companies as we believe in promoting the benefits of our training such as our pioneering e-learning approach to training. Things that we identified included one company who were willing to offer advanced training the day after undertaking their foundation course and that all of the other training providers that offer cosmetic courses, only allow their delegates to inject one model. Would you be competent after treating only one person during the day of your training session and would you be happy paying an average of £671 for this? Cosmetica allow you a full day of injection experience where you inject more than one model and you can attend our Combined Botox and Dermal Filler course for just £834. 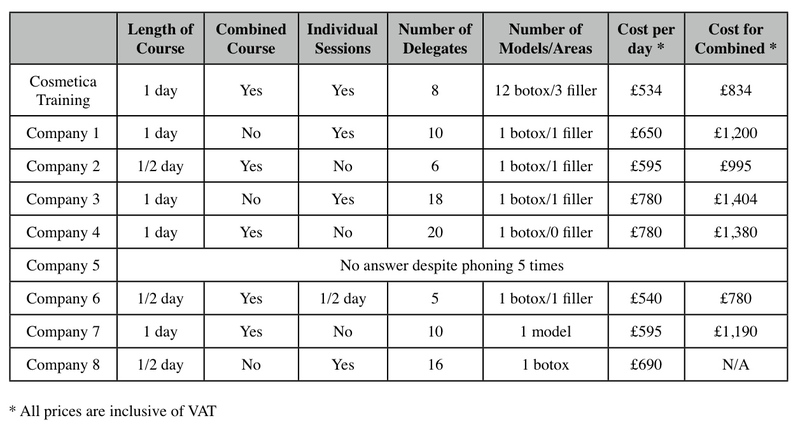 As we have a maximum of eight delegates per course and book in over 25 models we guarantee to offer the most amount of injection experience with training given by experienced, knowledgeable tutors. There is only one other company we found that sometimes allowed their delegates to inject more than one person on their Botox course, however, our courses are not like for like as their practical experience only takes place in the afternoon rather than over the full day as it does with Cosmetica. So next time we are asked “Why should I train with you?” we can categorically say we are the best training company in the UK as we provide more practical experience than any other aesthetic training provider.